School lunchboxes. Love them or loathe them, they are a necessary part of our day to day lives as Mums and Dads. Not only is the nutrient dense food that goes into them an essential part to raising happy healthy kids it is what they are made of that also needs to be looked into. A recent study found that most plastic products leach endocrine-disrupting chemicals even if they’re labelled “BPA-free”. Scary isn’t it. We have all been lead to believe BPA free plastics where safe for so long only to be now told by scientists that 70 percent of common plastic products tested positive for estrogenic activity, and that number rose to 95 percent when the products were subject to real-world conditions such as dishwashing or microwaving. You can read Dr Mercola’s full article here for more details and also read the full scientific documented report this article is based on. Given the rise in autoimmune disease, cancers and other immune related allergies in todays society, these toxic chemicals are the reason to search for safe alternative materials for storing our foods in. Glass is a great option but as Mums & Dads we all know kids can be a little rough with their school bags and safety at school can be a concern with glass smashing. Up until now Master 5 has been taking glass Pyrex to preschool without incident but with Kindy on the horizon next year I know the structured environment of sit down lunch breaks currently had at Preschool will be a thing of the past so a safe non toxic alternative needed to be found. One excellent choice I kept coming across in my search was food containers made of stainless steel, an alloy composed of natural elements. Stainless steel poses no health risks, is widely used in the food industry, and will not impart peculiar tastes or smells to your food. Knowing my love of all things non toxic Shelley & her team from Lime Tree Kids generously sent me some Lunchbots to try and to post a review on my thoughts and how they fared with the boys and our busy on the go lifestyle. Lunchbots is a family owned business which started in 2008 out of necessity when the founder Jacqueline Linder couldn’t find a product that suited her needs. Big ideas start in small places (her home garage in California!) and they have grown to be a worldwide success as people move to eliminate toxic plastics and chemicals from their lives. We were sent the Lunchbots Trio (in Turquoise), the Quad in Stainless as well as the Insulated Thermal in Green to road test. The Lunchbots collection comes in a range of sections from one to four depending on the use you require it for. This is also handy for children who don’t like their foods touching /combined with other items – something I know many of my blog and facebook followers face especially those with children on the spectrum. Master 5 has been taking his Trio sectioned Lunchbots container for his morning tea which as part of preschools requirements is fresh fruit (or veg). The container is compact (much smaller than the container we were previously using yet still holds the same amount of food so it’s a win for us space wise in his lunch bag (especially only being 5 years old – school bags can get pretty heavy!!) It is easy to open and close and the bonus is when I pack it the night before and put it in the fridge being stainless it keeps cool till morning tea time perfect for our climate in Australia. Master 3 is not yet at preschool but I find his Quad sectioned Lunch bots container just the perfect size to throw into my handbag for “just in case” snacks whilst we are out and about running errands during the day. For a child with so many allergies and intolerances finding safe store bought snacks (other than fruit) are not worth the risk, plus I prefer my children eat home cooked foods. I haven’t had any leaks and it is once again compact for his little hands to be able to hold and lay in his lap whilst we are on the go. They are also great for early Saturday morning growers market starts where I can prepare the night before pop the boys in the car and they can have smorgasbord breakfast on the way. If you follow my Facebook page you will know my boys are big fans of hot lunches (leftovers mainly). 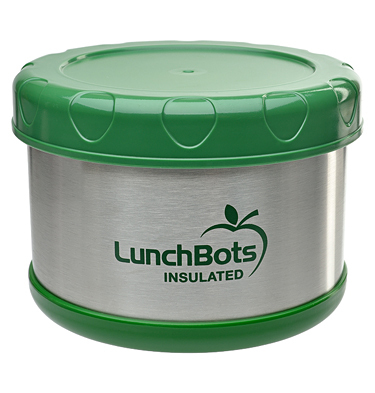 The Insulated Thermal Lunchbots container is the only child friendly thermos I have found with a wide enough mouth to make eating out of it easy. We have owned other cheaper tall cylinder style thermos before and the boys found it very difficult to eat out of (especially Master 3) but he has had no issues with the Lunchbots bowl like version. Its 450ml capacity also means it’s a decent size meal as well for my sometimes bottomless pit boys. We love that its leak proof meaning taking nourishing soups (which we eat a lot of) isn’t a problem anymore when we are out and about and it keeps them warm for up to 5 hours. The trick to keep food warm is to boil the kettle and fill the thermos with boiling water whilst you heat up the leftovers (I tend to heat them up a little longer than you would if youweree serving them straight away) in a saucepan on the stovetop if a soup, casserole etc or in the oven in a Pyrex dish at 180 deg for about 5-10 mins depending what it is) and then empty out the water and place the piping hot food into the thermal container. They are perfect for pastas, risottos, and slow cooker style meals. They also double in that you can use them to keep food cold (like yoghurts, fruit salads, or our popular chicken patties which are nice snacks cold). Pack the night before put it in the fridge and they will keep cool until morning tea/lunch time once again great in our climate. Now kids aside for just a minute, these products are great for us adults too. I recently “borrowed” these from the boys and took them to an all day seminar and had my snacks and lunch for the whole day. I loved how compact they where (I travelled part of my trip on public transport so didn’t want to be carrying bulky glass containers around all day) and loved how my food stayed intact the way I packed it the night before. 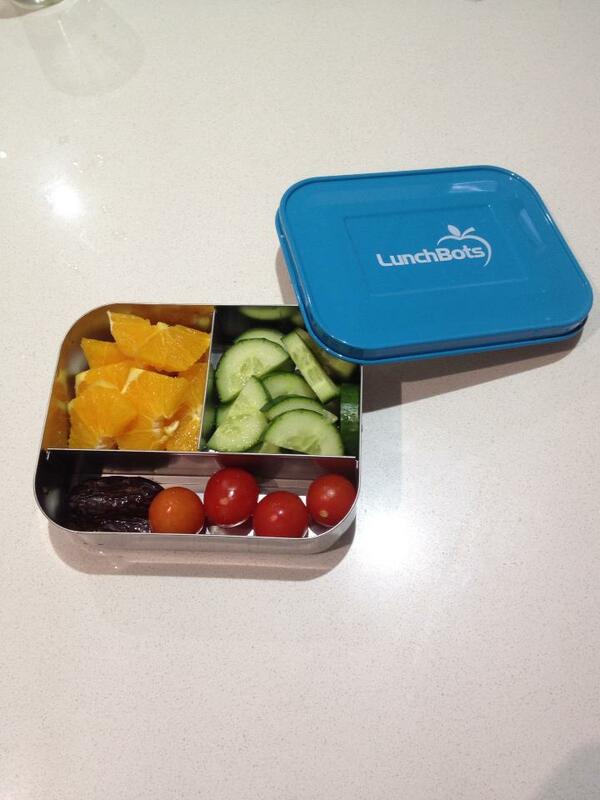 Not only is the Lunchbots range practical you have to admit it is visually appealing too! There are lots of funky colours to choose from and also available in the full stainless colour as well. It is something that is going to last you a very long time and when the time comes you no longer need it you can pass it down or simply recycle it, as stainless steel is one of the most recycled materials on earth. Cost wise, yes they are slightly more expensive than your average lunch box but the many years of use you will get from them and the fact your food isn’t coming into contact with hormone disrupting chemicals is priceless in my opinion. Lime Tree Kids has generously supplied us with a Lunchbots pack to giveaway to one lucky winner! All you need to do is LIKE Feeding Two Growing Boys and Lime Tree Kids on Facebook and go to the Lime Tree Kids website and check out their awesome range and on this blog post leave a comment below telling us which product YOU like the best! This competition closes Monday the 2nd September at 7.30pm when a winner will be drawn at random and notified on this blog post. Once you have made contact with us your details will then be forwarded to Lime Tree Kids in which you will have 48 hours to respond to their email as part of their contest policy. A huge thank you to Shelley and the super helpful team at Lime Tree Kids (one of my favourite online Kids stores) for choosing Feeding Two Growing Boys to receive and review the Lunchbots range and being able to educate everyone on finding safe non toxic food storage solutions. The online store also has lots of other non toxic food storage solutions including my new love Mason Jars which have been recently added as well as everything you could possibly need for life with kids! So put the kids to bed, grab a cuppa and browse the website it won’t disappoint!